The Stork Craft Portofino is one of the many four in one convertible cribs for baby, but what makes it so special is the fact that it features a unique and magical sleigh-like design. If your toddler is a big fan of Santa, then there is no better way to surprise him this Christmas than through a sleigh-shaped convertible crib! This will certainly become the most important piece in your nursery, as it is not only very stylish and extravagant (partly because of its outstanding color), but also because it is very stable and made of solid wood. The crib is non toxic and its finishes are durable – besides, as the name suggests, the Stork Craft Portofino four in one convertible baby crib is perfect for all the stages in your toddler’s life, as it can be used as a full size crib, then it can be turned into a generously spaced toddler bed, then into a day bed and eventually into a full size bed, for when your baby will be too large to sleep in the crib anymore. When it comes to Amazon parent reviews, the Stork Craft Portofino is certainly one of the most appreciated four in one convertible baby beds in the industry. Made from strong and sturdy wood of the highest quality, the bed comes with an attached changer that adds to the overall safety and security of the bed, while giving you some peace of mind at the same time. Besides, another aspect that parents just seem to love about the Stork Craft Portofino four in one convertible baby crib is the fact that there are plenty of matching accessories you can buy in order to expand the functionality of the baby crip: you can opt for an ottoman and a glider, a dresser or a chest, all of which being made by Stork Craft, just like the baby crib. 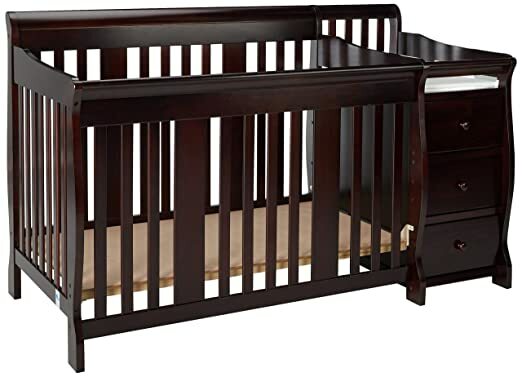 The baby crib is available in three beautiful colors and finishes (cherry, white and espresso), therefore you will not have a hard time finding the one that best fits the style of the nursery. Moreover, safety comes first especially when talking about babies and toddlers, and the Stork Craft Portofino convertible crib is designed to fully meet both the Canadian and the United States safety standards. Another aspect that parents love about this exquisite and versatile bed is the fact that it comes with three adjustable positions of the mattress support base, in addition to the waterproof vinyl change pad that is great for babies, as they always tend to wet the bed. Last, but not least, the baby crib is covered by a one year limited warranty provided by the manufacturer, Stork Craft. There is one thing that most parents complained about, and that is the significant odor that can be extremely bothersome both for the child and for adults. If you want a stylish, extravagant, original and unique four in one convertible baby crib that your toddler can use for several years, then the Stork Craft Portofino will certainly offer you a great deal for the money!